Hey there, I’m Xdog. 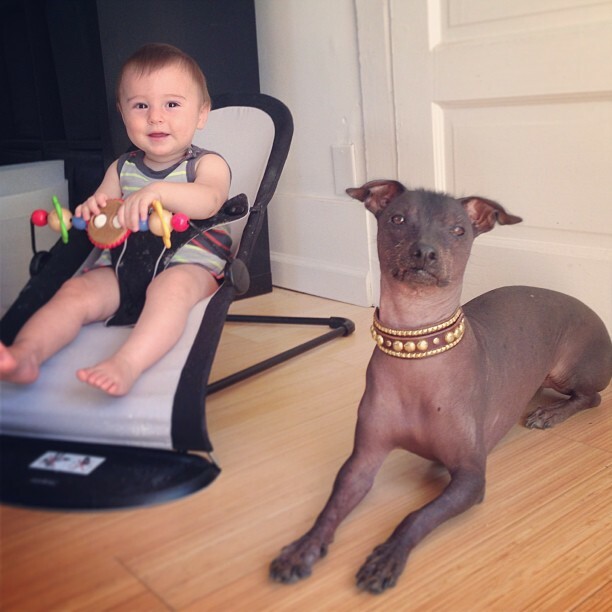 My real name is “Xochitl” but that’s too hard, and my breed is “Xoloitzcuintle” and that’s even harder, so just call me “Xdog.” I work at Paco Collars as a spokesdog with my main duties being modeling, traveling, and making sure the treats at the shop are of a high caliber. Anyhow, I just wanted to talk about my recent experience of becoming a big sister. Now, I’m not really a “kid dog”. I mean, do I look anything like Lassie? No. Kids have made me nervous my whole life since they’re all loud and unpredictable. Fortunately, my people know me really well (though they do get my dinner wrong every night, it should be at least twice as large*) so they worked really hard to help set me up for success as a big sister. First off, it helps that I’m crate trained and am used to foster dogs and visitors in the home. I understand the concept of slow introductions and that pattern makes me comfortable with new beings. Second, my parents did their homework. They found a ton of resources, like this site, this site, and this book. They set the scene way in advance and basically made my routine mimic what it would be like once the baby came. For instance, I sleep in the bed with the people, that’s just where I sleep. But they knew that wouldn’t work after the baby came so a full two months before he showed up they trained me to sleep on the couch… I got my own soft blanket and everything! They also started concentrating on special “emergency” behaviors like “go to your room” (the crate) and “touch” so they can call me out of a bad situation if things get sticky. Once the baby (a little boy named Levi) got here, it wasn’t really a big deal. Since we did slow introductions with no direct contact for a couple weeks it was pretty much the same as any other foster dog, though he looked a little weird for a puppy. It didn’t even bother me when he cried because I got used to it in my own time. My folks are doing a pretty good job of protecting me from the baby. They don’t let him have access to me, they don’t draw attention to me and allow him to “magnetize“, and they don’t demonstrate bad behavior. If the baby is coming toward me, they turn him around because if the baby is coming toward me, that means one of them is right there since they don’t leave us unattended… one of us is always crated if an adult is not in the room (that’s what they call that baby cage, a crate, right?). I gotta tell you, that thing was kind of an attention sucking potato at first, but then it started eating and things got really good! I mean, that thing gets food everywhere except its mouth… it’s like the best food dispenser ever! So now my job is to clean up after it, and I gladly accept my new role. He’s crawling now and starting to stand up on things but it doesn’t make me too nervous. I know that my parents will keep me safe and that he’s not allowed in certain places (like my crate or my bed) so I can always hightail it there if need be. So yeah, overall I think being a big sister is pretty much okay as long as the food keeps coming! *if you are as concerned as I am about the meager portions I receive as “meals” (I’d call them glorified snacks, really), then I urge you to send me food, treats, and maybe even toys at your earliest convenience. This address will suffice. This entry was posted in News, Xdog's Corner. Bookmark the permalink. Ana, I’m clearly behind on all news …. CONGRATULATIONS!! What very exciting news. Yeah! !